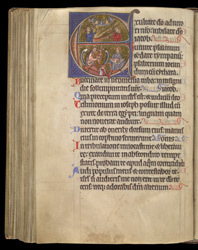 Five full-page miniatures have been inserted as single leaves into this 13th-century Psalter, but they are in a different, older style, and are probably re-used from a 12th-century manuscript. There is no trace of a calendar or litany, and lacking any liturgical evidence, the manuscript has been tentatively attributed to the East Midlands. Psalm 80 begins 'Rejoice to God our helper: sing aloud to the God of Jacob . . . bring hither the timbrel: the pleasant psaltery with the harp, Blow up the trumpet . . .'. In the initial to this psalm King David is shown with his musicians, playing a harp, psaltery, bells, and horn.